Australian delegations have joined the Singapore National Supercomputing Centre (NSCC) to commend the S$200m investment announcement, boosting their supercomputing power. 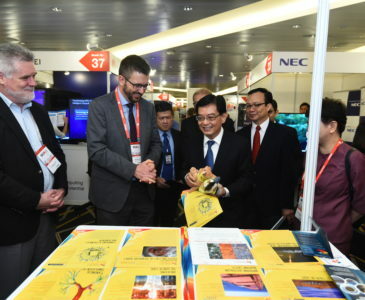 The announcement was made by Singapore’s Finance Minister Heng Swee Keat during SupercomputingAsia (SCA) 2019. The conference is an annual event that encompasses an umbrella of notable supercomputing and allied events in Asia. 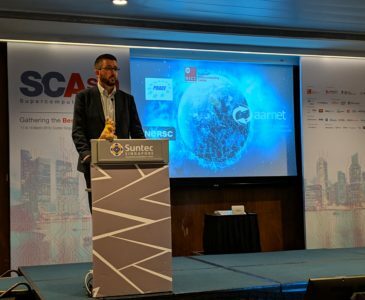 The Pawsey Supercomputing Centre, co-organiser of SCA 2019, were joined by the National Computational Infrastructure (NCI) and the Commonwealth Scientific and Industrial Research Organisation (CSIRO) representatives. 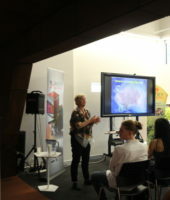 Focusing on ‘HPC Futures – Hyperscalers, Exa, AI, Quantum and Beyond’, the Australian team engaged with conference participants as an exhibitor, and also presented at conference streams, workshops and keynotes to showcase Australia’s scientific outcomes enabled by the power of supercomputing. 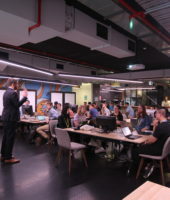 Australians are accustomed to their remote proximity to the rest of the world – they create ground-breaking approaches to innovation and enterprise, while working remotely and at scale. In both his Opening Remarks and Plenary Keynote, Pawsey’s Executive Director, Mark Stickells extoled Australia with this unique ability to communicate, collaborate and work beyond its immediate region. Creating a recognised Asian Zone in the global supercomputing network depends on our ability to engage, partner, collaborate, and work at scale across both geographic and organisational boundaries. “It makes sense to work with our close partners in Asia and grow our region as an important High Performance Computing (HPC) zone of influence and innovation. 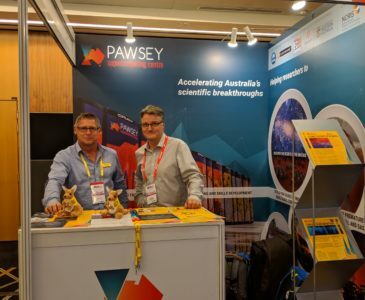 Pawsey’s connections and partnerships underpin our efforts to deliver better, faster and more innovative scientific outcomes to benefit not just our own nation, but our global community,” he addressed. The Australian High Commissioner to Singapore, H.E. Mr. Bruce Gosper, joined Mark with his opening remarks at the conference, supporting the collaboration efforts between Pawsey, NSCC and the emerging Asian Zone. The physical ability for Australia to connect is strengthening by the new INDIGO high-speed link which is nearing completion between Singapore, Jakarta, Perth and Sydney. The subsea cable system includes consortium members from Singapore, Indonesia and Australia, and will strengthen links between Australia and south-east Asia, providing high-speed broadband with low latency and enhanced reliability. This world-class data connectivity will provide critical infrastructure and greater flexibility as our Asian zone of HPC activity continues to develop, supporting our growth in collaborative education, research, development and the digital economy. 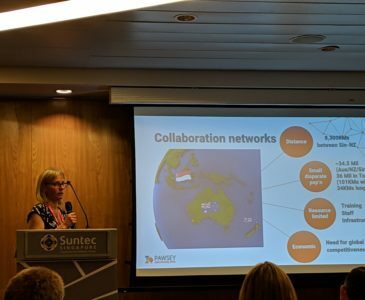 In the Australia-Singapore-Japan stream, Dr. Jenni Harrison, Director of Strategic Projects and Engagement; and Mark Gray, Cloud Lead at the Pawsey Supercomputing Centre discussed the current and future directions for HPC at Pawsey. Pawsey and the National Computational Infrastructure (NCI) discussed how Australia’s research infrastructure will be future proofed as well as the current and future directions of High Performance Computing in Australia. An important consideration made during the presentations is that at the intersection of different disciplines, industries, cultures and experiences is where the real breakthroughs happen. “We can’t just focus on hardware and software, we have to work on engagement, collaboration, and diversity. We need to grow and diversify our digital talent base within Australia, and we are working at Pawsey and through our partners to do that. By collaborating with our Asian neighbours, we can immediately bring additional perspectives to our search for meaning and problem solving. In doing so, we all enlarge our discovery bandwidth”, Mark Stickells remarked in his opening for the Australia-Singapore-Japan stream. Head of Centre Operations at Pawsey, Brad Evans participated in a panel discussion looking at the current HPC trends in academia, including their key technologies and whether there is a skills gap for designers, builders and operators. Joined by NSCC, Microsoft, Alibaba Cloud and Director of the Murchison Widefield Array (MWA), Professor Melanie Johnston-Hollitt; the limitations, changes and future of HPC in the Asian Zone were addressed. A key priority for nations across the world is the Square Kilometre Array (SKA) – a global mega-science project and international treaty. Pawsey provides infrastructure and operational support for two key projects to the SKA, CSIRO’s Australian Square Kilometre Array Pathfinder (ASKAP), and the Murchison Widefield Array. Both telescope arrays are in the remote mid-west of Western Australia, and are now operational, sending their data by fibre optic link 800 km to Perth where it is processed in real time by Pawsey’s dedicated Galaxy supercomputer. With immense amounts of data predicted to be processed at the Pawsey Supercomputing Centre, there must be a deep understanding of radio-astronomy requirements from both a personal and technological standpoint. Astronomers live in a dynamic domain where priorities can shift as discoveries are made – thus, we must keep our systems and technology dynamic too. Both Professor Johnston-Hollitt and Brad Evans reflected on the same sentiment from research and infrastructure standpoints. Pawsey’s participation also included a full day Spectrum Scale (GPFS) User Group run by Pawsey’s Senior Storage Systems Administrator, Chris Schlipalius. The day was filled with a range of GPFS experts presenting on a wide variety of topics on Spectrum Scale, filesystem and storage. To showcase the researchers benefiting from services and expertise at the Pawsey Supercomputing Centre, Professor Lloyd Hollenberg, from University of Melbourne presented at the Quantum track, discussing the ‘Reality of Quantum Computing’.